Part 3 .. 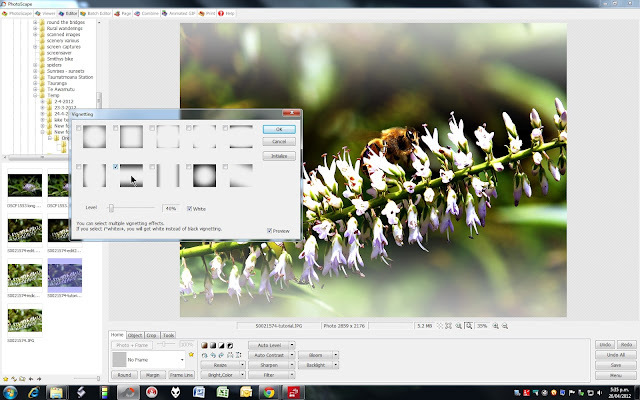 Using Photoscape and its interface. There isn’t a lot to do now. At the moment the image still looks a little dark, but that’s been the goal for us. 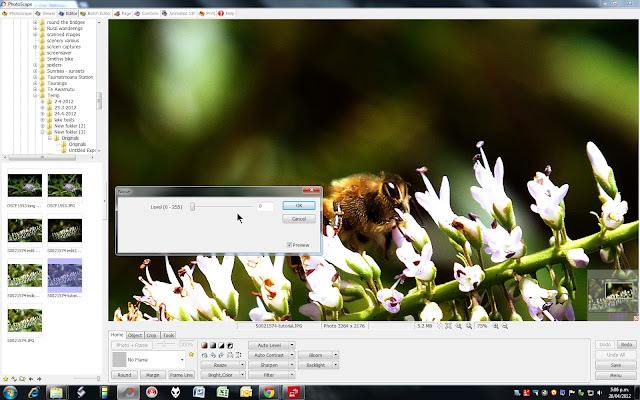 There is nothing to say one has to strictly follow this tutorial click for click. Far from it. It does however serve to demonstrate just what you can do, to your own tastes with Photoscape. Remembering that we have only touched on some of the many options that are available with this software. Now back to our image. We have so far calmed the image down, introduced more clarity and warmed the image as well. The image is still a little too bright in the back ground, so we will once again head to the Bright,Color button and select the Darken slider. You may think this is a little odd to start with but watch what happens to the background. If we had selected Darken Middle for instance from the sub menus, we would have succeeded in darkening slightly only the mid tones, thus the background would still appear too bright as a result. Choosing this option is a more holistic method as it applies to the entire image. Note that the steps taken earlier to isolate and warm the image help in keeping the image bright where we want it, on the Bee of course. The level I have chosen is 23. You may choose less or more for your own taste or as the image may require. Remember there not set rules to doing this, its generally what looks good and is pleasing to the eye. Next up we are going to apply another sharpen. You may wonder why this is done. All the elements that we have introduced so far have added or subtracted in various ways from the image, we therefore want to ensure the image is a crisp as possible. I have selected 7 from the sharpen sub menu, as this will use a fine radius and be a less aggressive amount of sharpening. Remember all we are doing is making sure the image is crisp. I have zoomed up the image to 70% as I’m also making sure that I am not introducing sharpening Halos around the image. This would look like a faint glow around the edge of the image components. That done I will then select the Full screen button and view it at full size on the monitor. I use a 22inch AOC widescreen monitor, color and gray-scale calibrated, using the software that comes with the monitor. This has proved to be very accurate when I have prints done. What I see on the monitor is what I get when I print. You too should be aiming to get the same result. The reason for viewing the image at this point in Full Screen is to check the overall look of the image and see if we are achieving the result we were after. So far things look pretty good, so we can continue. Now that we have made all most of the changes needed it time to deal with the noise. Every time we adjust the image we risk adding noise to it. The worst contributor is sharpening. This is why I advocate using the HS20 with sharpening set to hard. The in camera sharpen in the EXR modes is very good and adds little discernible noise to the image. Shooting the lowest possible ISO at the time also helps hugely. To deal with this issue I select Noise from the Filters menu. About now you are probably going, What? Bear with me, all will be revealed. At this point the image is pretty well noise free, so we are going to introduce some. By default the noise control is set to 128. Move the slider to zero and watch the result, we are now sure that any noise still in the image can be handled with noise reduction. To do this we will select smart blur from the filter menu. In the second image you can see the automatically applied amount. This image has little noise so we use smart blur to smooth it very slightly. 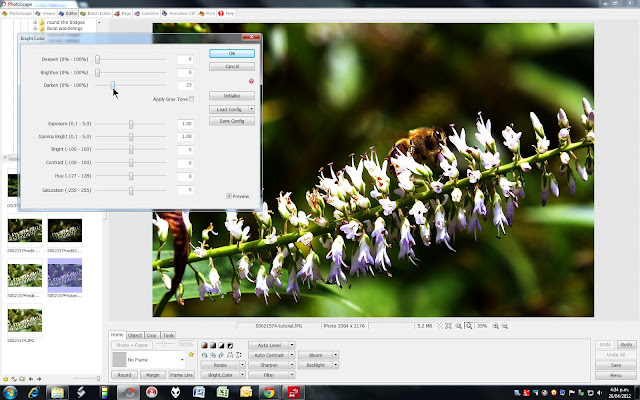 Unlike the noise control options, which aren’t adjustable we can select the level required for the image. An analogy would be akin to a woman using a foundation under her make up. Its designed to smooth and blend. This is very effective when used for portrait work and helps with skin tones. Setting Noise levels to zero. Having now applied a little noise control we will crop the image slightly and get rid of the rubbish on the left. As I don’t want to enlarge the subject, I am only cropping the width. The image shows a crop area that has the height reduced. By doing this I would have enlarged the image and this is not the result I want. To maintain the image aspect I therefore select the crop in a single direction. That done there is only one task left to us, in as far as the images processing is concerned, and that is to add some contrast. Selecting the amount to crop. 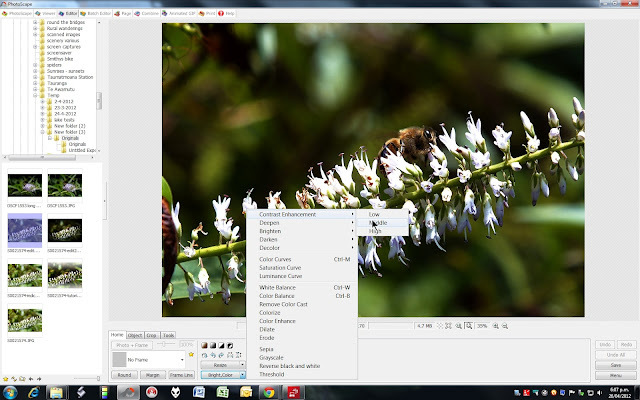 Note that the Crop tab has now been selected. 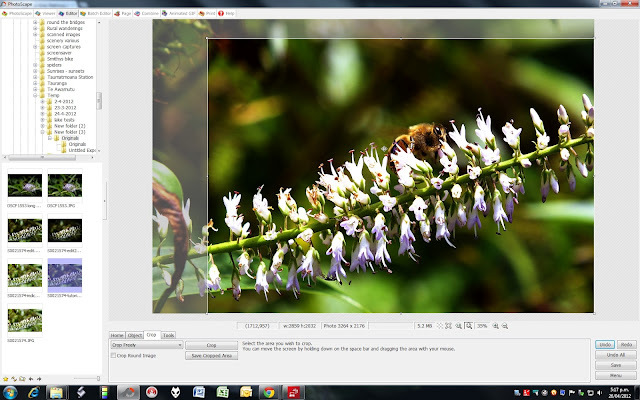 You have the option to save your crop as a separate image if you wish to. We do so by selecting the Bright,Color sub menus and selecting Contrast Enhancement. We do this rather than the standard contrast slider adjustment, as this method is more pixel oriented. Using this method enhances the contrast between the color boundaries of the individual pixels in the image. To use the main slider for contrast, we would achieve a totally different outcome. By all means have a play with the controls, you will soon get the hang of it. 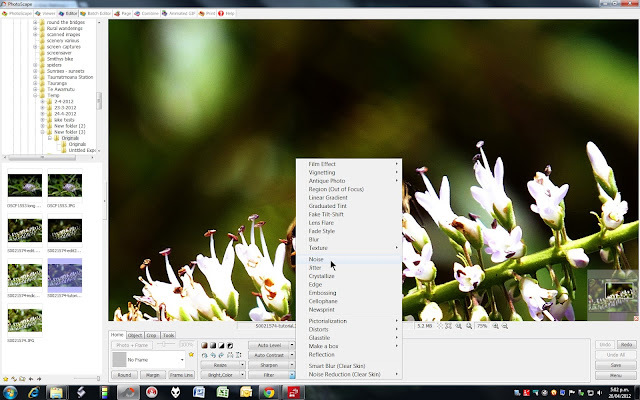 Lightroom 3 users will have a similar set of controls in the Luminace Filters panel. The option for color and detail effectively does the same as Enhanced Contrast in Photoscape, but allows more subtle control. Selecting level of Contrast Enhancement. When you apply this its up to you to decide what looks best. I usually like to see the image pop when applying this change. As a rule I normally set this to middle and watch the image. 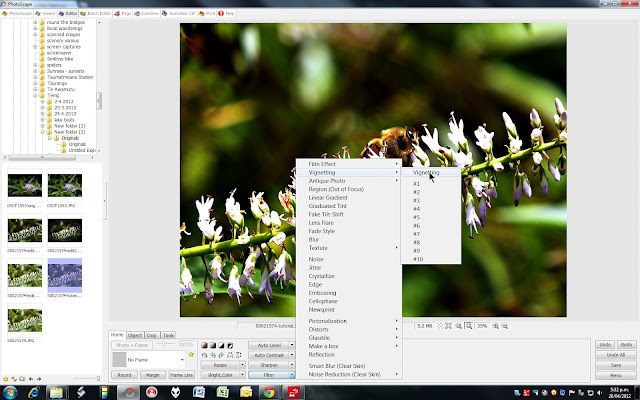 Its best to have the image zoomed out so that its all visible in the editor window. You will note that when this has been done it almost appears as though you have sharpened the image again, and it certainly can give that impression. There is no residual noise created with this process. To help give our Bee a more personal looking space we are going to use a small white vignette to encapsulate our Bee and its branch. We don’t want to treat this too boldly so we will use a small amount. Access the Vignette sub menu from the Filters menu. You will see the word Vignette above the top of a list of numbers. Click the word not the numbers as we want to select our options first. For this image we will use the two horizontal lines choice, with 40% opacity selected. Remember that little Mayfly? we don’t want to lose him entirely either, hence the opacity reduction. To use a white vignette simply click in the check-box marked white and then OK the selection and its all done. Selecting the Type & Color and opacity of the Vignette. The only job left to do now is to name and save your image. 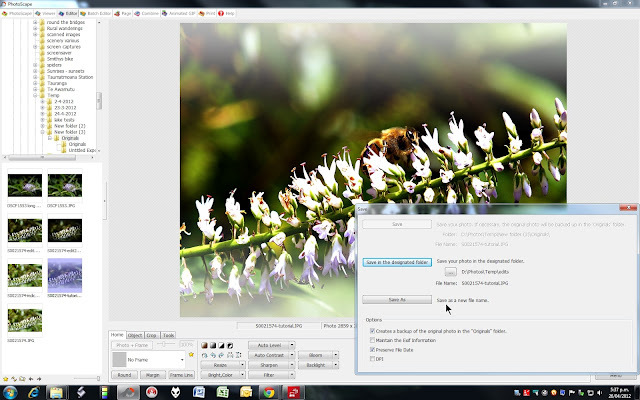 I always choose the first option as Photoscape will put your original image in a separate folder entitled Original. Make sure that you select 100 for image quality when saving and if you are printing, click the DPI toggle at the bottom of the page and select 300dpi as this is the normal image requirement if you are getting really large prints done from a lab. The Save screen and options. Below are three images. The first is the original that we choose to use. The second is the final product of our work. The third image is the same as the two above, but I have excluded the warmth changes and used a black vignette to show how the same image with very little effort can look a lot different in the final rendition. As always these things are a matter of personal choice. We could have easily worked on the original image, leaving it bright and changed the look completely by doing so. 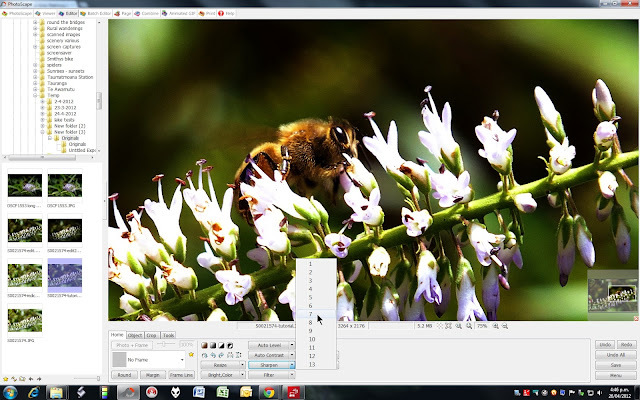 The result of our effort here I think achieves the objectives we were aiming for, namely to calm the image, reduce background interference and personalize the Bee’s environment, so as to create an effect whereby we are looking into its world. I think to a large degree this has been achieved. Give it a go. I’m happy to host the images here if you would like. The original image is full sized, just click through to the full image and save it to your computer. Have fun. Thanks… I didn’t want to make it overly technical. Think I got it about right. I appreciate the time and effort you put into your tutorials. I’ve been using Photoscape for just a short time, in a learning mode, so this really came in handy. One quick question. You mentioned calibrating your computer screen so it harmonizes with the print. What software/freeware do you recommend for calibrating my laptop monitor? (Does it depend on what brand of computer you have?) Again, thanks for the great tutorials – I’ve signed up to receive your blog updates. Hope you’ll publish some more Photoscape-related stuff before long. I’m glad I was of some help. Every image I post here has been PP’d with Photoscape unless specified. If you see something and would like to know how its done I can do a step by step post for you. As for monitor calibration it depends on the set-up. I use Radeon graphics cards in my PC’s and Win7. The calibration tools in the video card drivers or from the windows control panels have proved to be a very good match for printing both to my Brother printers and with Fuji Photo centres. I haven’t tried the HP Photo processing and that may mean different calibration. There are some high end calibration tools around but I’ve found the my Benq and LG monitors both calibrate very well just with the included tools in the drivers or windows. Nvidia card drivers should be the same. This article from PC world should also be of some help as it goes into more detail with using the tools I have mentioned. Very good but your white is still blown. I usually use the luminescents curve to darken the white and usually I get more detail from the white when it is blown out like this photo. Also when you use the contrast button some times you get more blown detail in the white area and considering the amount of lost detail you have in white it is definitely something you should look at. I found your noise reduction method interesting. I usually do noise reduction before I sharpen and it seems to work better. No mistake. The whites on the bottom flowers are properly exposed. The top flowers are brighter ( hence the tendency to blow out) as the sun was shining directly from above. Exposing for the top flowers would have led to underexposure on the bee which was the intended target. It was a deliberate trade-off knowing that the HS20’s sensor even in dynamic mode doesn’t always have sufficient Dynamic range in some of these harsh light conditions. My XA2 however would have dealt to this much more favourably. Changing the white levels tends to lose definition in the rest of the highlights. Had I used RawTherapee or Lightroom I could have gotten a little better result. But the over riding fact is blown highlights have no detail anyway and no amount of adjustment is really going to help. Yep increasing contrast also adds to the problems if you dont select the right option. Increasing contrast can of course bring out features from shadows as well. If I’m using Lightroom or RawTherapee I too tend to do Noise Reduction before sharpening, but in Photoscape I have found the reverse to be the case, with less tendency to create halos.